Mrs T makes lots of friends because she’s very garrulous and very gorgeous. She either accosts people or they accost her; either way they all end up taking a small promenade around our vegie patch, holding a cup of coffee or tea in their hand and chatting like sisters, brothers, daughters, blissful in each other’s company. I’m more of an indoors grump, slaving over ancient Greek and preposterously interesting emails from all sorts of people, from staff and students of unis and other educational institutions or thespians of every description. But late last year we decided to put my idea into practice and now we are both constantly chatting with people from many miles away who have heard of this idea (MINE, thank you very much), which was to allocate the front meter and a half of the front yard to herbs and to make sure people gather them as they need them. The response was quick and abundant. Young and old couples stopped, knocked on the front door and asked us if it was true they were allowed to pick whatever herb they liked and could they take a photo of the patch. 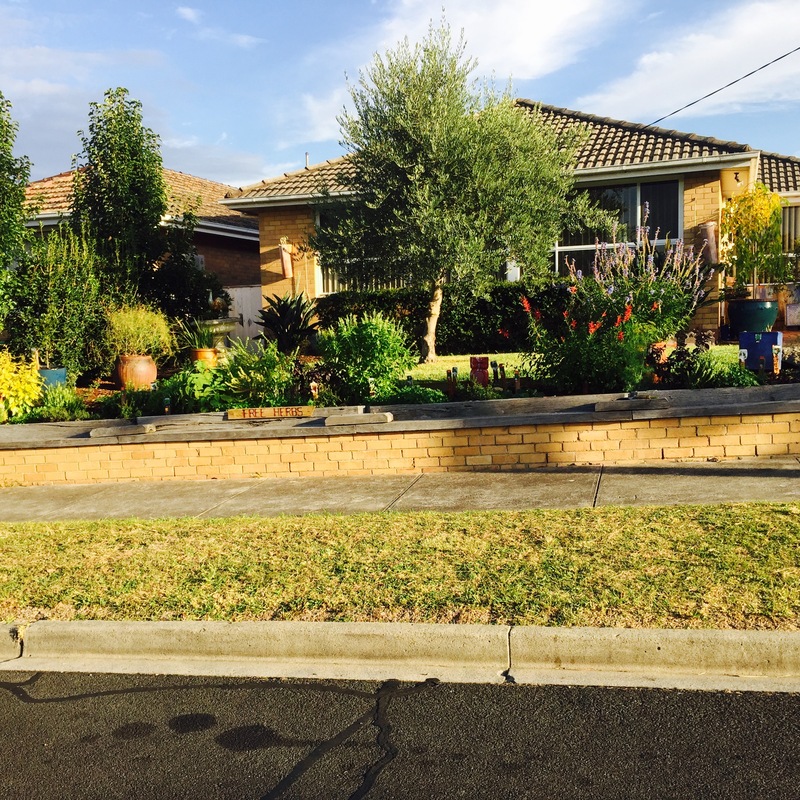 Most of my neighbours are Asians of one sort or another, Vietnamese, Chinese, Korean, Indian, Singaporean, so the photos of our front yard are now known almost as well and as widely across the globe as my translations page! I love watching parents and grandparents of very young children stopping, picking up a few leaves and bringing them up to the kid’s nose. The expression on those little faces send joy tremors up my spine and chuckles in my heart. I’ve moved into an address that has enough room to grow a farm of whatsoever. However the ground is clay that bakes as hard as the rock of Gibraltar. I need to dig gypsum and mulch in. That is not going to be so easy. The back yard is two or three building blocks in dimension. I have to save up for it. I however planted hundreds of seeds, hopeful. At the far distance in the middle of the left side of my massive back yard, of otherwise dry stalks of hay chewed over by the birds, one zucchini plant has survived and at the same far distance in the middle of the right hand side, one cucumber plant. How would you be. I have both of these at home, a thoroughly gorgeous/garrulous wife, and a herb garden, but this idea of letting passers by pick their own herbs is fabulous. Like you two, Mrs M is the brains of the outfit, I just prune, fertilise, make mulch, assemble new beds, and carry stuff around. Love your house, it’s been transformed from an ordinary (is there really such a thing? suburban place to a cornucopia! Excellent idea GT. I don’t always get through fresh herbs and have to throw some out. Worse is the price. We grow some of our own HOO, Tarragon grows wild. The sage just keeps growing. The basil was very good this season. We have some we do buy but like you have to throw some out. Oops, forgot tarragon, thanks, alge! That patch looks even better now. These photos are a couple of months old, taken before the sage and the aniseed (forgot to mention above) plants flowered. Gorgeous little red flowers from the various types of sage and similarly gorgeous but purple flowers from the aniseed. Bees everywhere and when these photos were taken there were also lady bugs partying all around the place. It is a wonderful place to be and every day, once in the morning and once in the evening, I take my secateurs and little spade and walk up and down the patch, pretending I’m doing stuff but I just want to stand there and admire my -probably the best ever- idea. When the sun is out, it is Paradise and I can actually see the face of Zeus smiling! I’m now building up another little patch in the back yard for “stalky” vegies, like spring onions, leeks, celery, etc. It’s only a small patch, 3X1.5 ms, so I can’t put too much but I’ve discovered that such an exercise is life enhancing. My sage self seeds and I have to pull plants out. Or, let one grow and remove the old one. They can last well for many years but get a bit woody and need pruning (would you believe). Every other herb I have just keeps on coming year in and year out. I whipper snipper the oregano and mint when they go all leggy. One thing I’ve never been able to successfully grow is basil ! Third recent go at basil. snails went berserk. The snails that aren’t supposed to be there because of the frogs. Bad to use Defender when frogs (and dogs) are around. I live fresh basil from the garden !!! Basil needs lots of water; and sun, of course, which is what all other herbs need also. Lots of water for basil, though reasonably well drained soil. I’ve never had any problems with it, nor did my parents, though we’re all very herby people and grow them not so much for the food but for the aroma. That’s what herbs are for, to scent your garden and to toss in your food at the very last minute of its cooking or immediately after so as not to kill the aroma. The sages can get quite tall and woody but they’ve behaved themselves so far. Mind you this patch is only about eight months old. I have some Thai basil, some vietnamese mint and some coriander all of which get quite a lot of… loving, if not pruning from my asian neighbours. 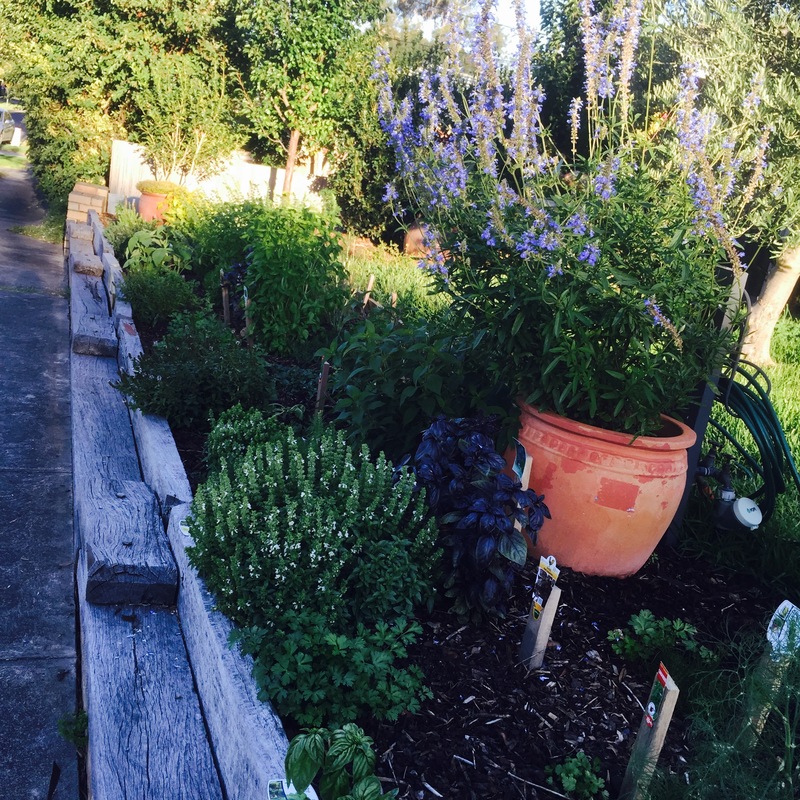 I get this double gratification these days, one from my ancient Greek translations blog which gets a great deal of love and attention and from this herb patch. I don’t know how happy Larry is these days but I reckon I’d be at least as happy as him. I gave up on basil a long time ago. It’s survival of the fittest here! What a lovely gesture of kindness and thoughtfulness -beautiful ! What an absolutely wonderful thing to do. I wish I was your neighbour. I like how your garden grows! I have chuckles in my heart and up my nose. Thank you!!!! Many thanks, ‘Mou. Great to hear from you again. Kind regards, Emm. Many thanks for posting, Tezza.